The Commonwealth Games debacle is not yet over and the Congress led government is about to commit another blunder. It seems Congress has lost all its control over its Ministers who are blatantly engaging in corrupt practices and maladministration. Firstly, it was the spectrum scam now it is the commonwealth organizing committee that is clearly and unambiguously involved in corrupt practices. Prime Minister Manmohan Singh and Sonia Gandhi are looking helplessly, even if they are not involved in these corrupt practices that have brought great disgrace to India. Surprisingly, they have not learnt any lesson from their past mistakes and inactions. Now the duo of Manmohan Singh and Sonia Gandhi are extending their support for another Anti National Project named as Aadhar Project of India or UID Project of India. 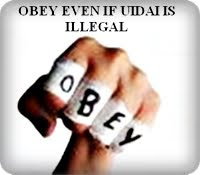 Both Aadhar Project and UIDAI are unconstitutional project and unconstitutional authority. Neither the Aadhar Project nor the UIDAI are governed by any Legal Framework nor are they under Parliamentary Scrutiny. The Union Cabinet has casually granted its approval to the National Identification Authority of India Bill 2010 (NIDAI Bill 2010) with great disregard to the Civil liberties of Indians, especially Privacy Rights of Indians. Even after this approval, both Aadhar Project and UIDAI are still “Unconstitutional and Illegal”. There should not be any action upon UID Cards and Aadhar Project till proper safeguards are at place. It seems the duo of Manmohan Singh and Sonia Gandhi has not considered this aspect. The “Constitutional Scheme” of Indian Constitution has kept the functions of Legislature, Executive and Judiciary separate. Yet the Executive are encroaching upon the regime of Indian Parliament and are implementing Projects and wasting crores of public money without “Parliamentary Approval”. Under the garb of welfare scheme and development all sorts of irregularities and illegalities are given full support by the Congress led government. It is high time for the Congress to change the “Anti National Mindset” that is seriously damaging the reputation of India and faith among Indian masses. No time in the history of India, the civil liberties and human rights of Indians were at such a great stake. Illegal and unconstitutional projects like Aadhar project of India/UID project of India, Natgrid, CCTNS, etc have crossed all the constitutional limits and Indian citizens and Indian courts are just moot spectators. The suo motu powers of Indian constitutional courts has all of sudden vanished and the courts are not finding anything wrong in allowing projects that have no legal framework and parliamentary scrutiny to back them up. Take the case of the most dangerous of all these projects named as Aadhar project. It is headed by Nandan Nilekani as the head of unique identification authority of India (UIDAI). However, it would be more appropriate to call the Aadhar project as Niraadhar (without any base) and UIDAI as “unconstitutional identification authority of India”. To start with, Indian citizens must say a firm and absolute “No” to the Aadhar project and giving away biometric details. India does not have any dedicated data protection and privacy law. Even our basic telephone numbers are freely available to telemarketing companies. By making available all our personal details along with biometric information, we are heading towards a big trouble. It is high time to go for a “mass boycott” of Aadhar project and force the Indian government to enact suitable privacy and data protection laws before any such project must be proceeded with.